Today in History–August 19–the Library of Congress features the burning of the capital city by British troops during the War of 1812. On August 19, 1814 the British landed at Benedict, Maryland. 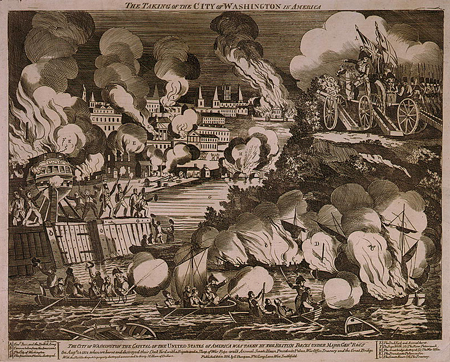 Five days later, on August 24, British forces attacked Washington D.C., setting fire to many government buildings including the White House and the Capitol building (which housed the 3,000-volume Library of Congress at the time) before quickly moving on to Baltimore, Maryland. Learn more by visiting the Today in History section, then click the links below to access more resources and primary sources for the War of 1812 and the Treaty of Ghent, which marked the war’s end. 1814 Attack on Washington, D.C.